Mulching leaves into the lawn. When grass grows in good soil containing lots of organic matter, the lawn is easier to care for and looks great! The easiest way to make sure the soil under the grass is good is to leave layers of chopped leaves on the lawn every fall. The leaves become food for the microbes that populate a healthy soil. If you have the average lawn which is about 6000 square feet, you can leave the equivalent of over 150 bags of leaves right on your lawn, feeding the soil, and saving all that work of raking and bagging. Leaves as Mulch around the yard. The mixture of chopped leaves and grass clippings makes an outstanding mulch under any plant on your property. Spread the material 4 to 6 inches thick over garden beds, under shrubs and hedges. The leaves will settle down by at least half after a few rains. COMPOSTING FALL LEAVES TURNS GARDEN TRASH INTO TREASURE!! 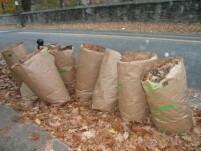 You may already know that composting is a better way to deal with bags of leaves and backyard waste. But if you’ve avoided composting because it seems like too much work and mess, or you just weren’t sure how to start, fall is a great time to try your hand at turning this year’s yard debris into next year’s natural fertilizer. Click to learn more about composting leaves.